Holds (2) 11" x 8-1/2" portrait or landscape style prints on the front and back. Bold, black border makes displayed signs stand out. 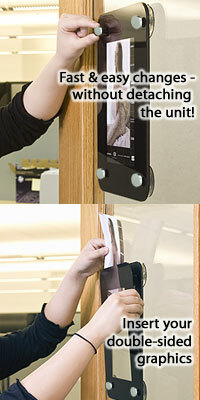 Includes six suction cups to easily mount to windows or glass doors. 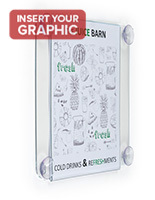 These acrylic signs are perfect for advertising special promotions, new menus or other important information, as a result of their neutral design. 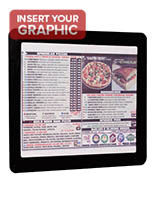 These plastic frames feature a bold black border, ensuring your advertisements will be noticed. 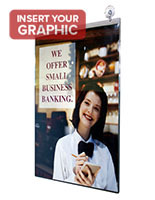 These acrylic signs, also known as window signage displays, hold (4) 11" x 8-1/2" prints, two on either side, to reach a broader audience and to display more than one advertisement at a time. These plastic door frames also permit fast and easy graphic changes. 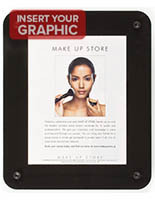 Printed advertisements can be changed by simply unscrewing the decorative screw caps, and separating the two acrylic panels. 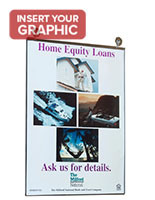 Acrylic signs, such as these window display frames, are an effective means of communicating with visitors, even after business hours. 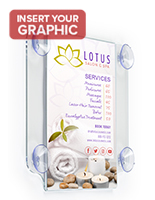 Each plastic frame comes with six suction cups, enabling users to easily mount the displays in seconds! 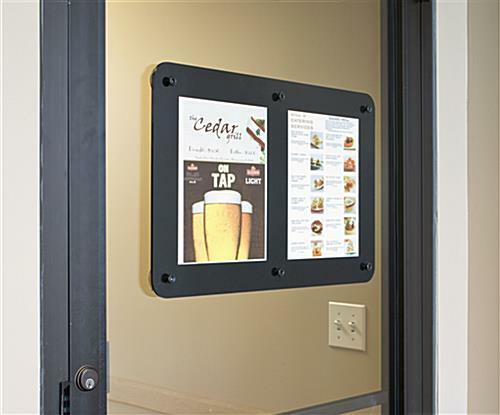 These acrylic signs are designed for mounting to any non-porous surface, such as an entrance door to a business, or glass window of a storefront or restaurant. 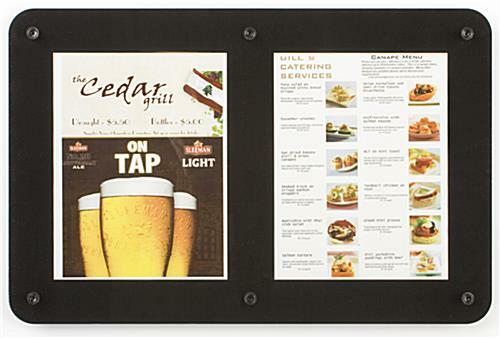 These signholders are ideal for luring patrons into your establishment. 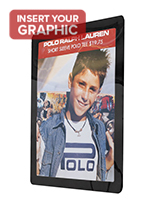 The universal design of this display makes it ideal for use outside of a business to display hours of operation. 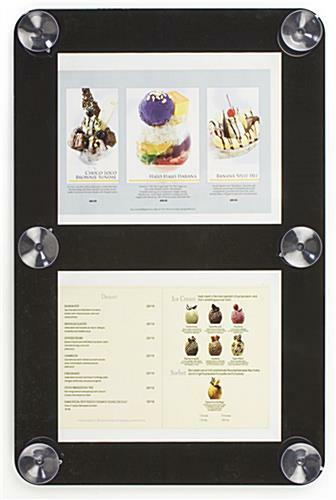 These window advertisement holders can even be used by a restaurant to promote new menu items or nightly entertainment. 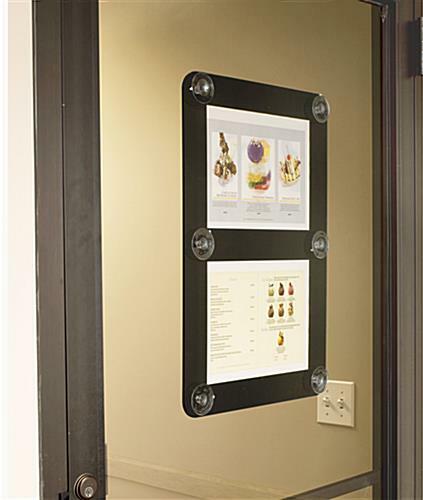 Retail stores could also use these plastic frames to greet customers with messages like "Welcome", "Thank You" or "Please Come Again". 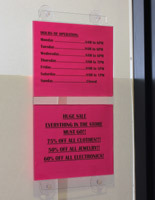 Sold at an affordable price, this signholder is an affordable alternative to expensive neon signage. Purchase yours today! 23.0" x 15.0" x 1.5"